A new fluidized bed combustion system is offsetting tipping fees at an Ontario recycled paper mill. In operation for more than a year, a Precision Energy Services (PES) sludge-to-energy system at Atlantic Packaging’s Whitby mill processes 100,000 tonnes per year of paper mill sludge that was previously being sent to local area landfills, eliminating the cost of sludge disposal and reducing the cost of fossil fuels by the offset generation of plant steam. The mill, formerly a producer of newsprint, reopened in 2013 after the company undertook a conversion project allowing it to produce 100 per cent recycled lightweight paper for the manufacture of high performance corrugated packaging products. In addition to the Whitby location, Atlantic Packaging owns and operates two other recycled paper mills – the New Forest Paper mill and the Scarborough Liner mill – located in Scarborough, Ont., the home of Atlantic Packaging’s corporate office. The Whitby mill project is the integrated corrugated packaging company’s second PES sludge-to-energy system implementation. In 2011, PES supplied a similar system to Atlantic Packaging’s Scarborough Liner facility – 111 Progress Avenue – replacing combustion technology that was unable to reliably burn the wet paper mill sludge. “We are excited to announce that our client’s second sludge-to-energy plant was completed in early 2017. Our client will see a sufficient reduction in the plant’s overall waste disposal cost as well as a major reduction of their energy costs by the savings obtained in burning the biomass fuel to produce steam, offsetting the use of natural gas,” says Mike Oswald, president of Hayden, Idaho-based PES. In 2016, PES received a design, supply, supervise and startup contract at the Whitby facility for a complete biomass energy system incorporating its Fluid Bed Combustion System. It designed the system to supply the necessary energy in the form of hot gas to dry the 60 per cent + MC wet basis sludge to 40 per cent MC wet basis with the majority of the energy produced from the sludge used to generate process steam. As a result, the combined energy is produced from a single system without the use of natural gas, says PES, explaining that natural gas is only used for startup of the system to obtain the required temperature for sludge feeding. 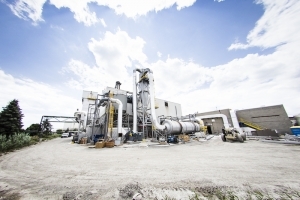 Producing process steam from the sludge-waste residuals – or biomass – promotes the plant’s green energy independence and the company’s green recycling plan by reducing the volume of waste sent to landfills. “I think (an increasing number of) pulp and paper companies are being more green-oriented and (concerned) with the recycling and re-utilization of waste fibre,” says Oswald. PES designed the complete system and supplied all system equipment, including: the wet and dry sludge storage bins, the wet sludge feed system to the dryer, a single pass rotary drum dryer, the dry sludge collection and storage bin, the dry sludge fuel metering and conveyance system, the PES Fluidized Bed Combustion System with automatic ash cleaning system, a 35,000 PPH, 250 psig waste heat boiler specially designed by PES to allow removal of the high ash quantities generated from the fuel, the boiler economizer and air heater, gas cleaning system, and ash collection and storage silo. “Many recycled pulp and paper plants have this problem. When you (operate) recycled paper plants, you have to take what is available as far as raw material and all that material does not necessarily re-pulp for you and you get a degree of material that is fibre but is not usable for paper. It is an industry-wide problem,” says Oswald. The majority of the sludge-to-energy system was designed to fit into the Whitby plant’s existing infrastructure, allowing most of the equipment – including the boiler system – to be inside the existing building with only the dryer, baghouse and ash silo outside of the building. A small portion of the building roof was removed to install the boiler system, although the height of equipment required a penthouse to be installed over the boiler. The sludge-to-energy system receives and processes the incoming sludge, and combusts the sludge leaving only an ash that is white in colour with no carbon residual. This ash, according to PES, is collected from nine points throughout the boiler, economizer, air heater, multiclones and baghouse and is conveyed pneumatically to an ash silo. The ash system was designed and supplied by PES to have no rotary valves, which it describes as a constant maintenance issue on biomass boilers. The sealed ash system conveys all of the fly ash to a sealed ash silo for unloading into sealed trailers, which PES says will help ensure the complete boiler system is sealed from the point that the fuel is pneumatically conveyed into the fluid bed combustor. The ash is held in the ash silo for pick up by a nearby cement plant where it is utilized as an admixture to the manufactured concrete. As a result, the ash from the sludge presents the mill with major environmental and sustainability advantages, as it does not require landfilling, says Oswald. The ash produced by the boiler system has very similar properties to Kaolin clay, a feedstock which accounts for approximately 40 per cent of cement’s composition. The sludge ash can be added (substituted) at approximately 5 per cent by weight, and actually, improves the final concrete performance. If the ash were to be used in a ready-mix plant, it could be used to directly substitute cement, but the sludge ash would require grinding to a consistent, fine particle size. PES has successfully designed and implemented ash-grinding equipment in other energy systems to increase the marketability of the ash.